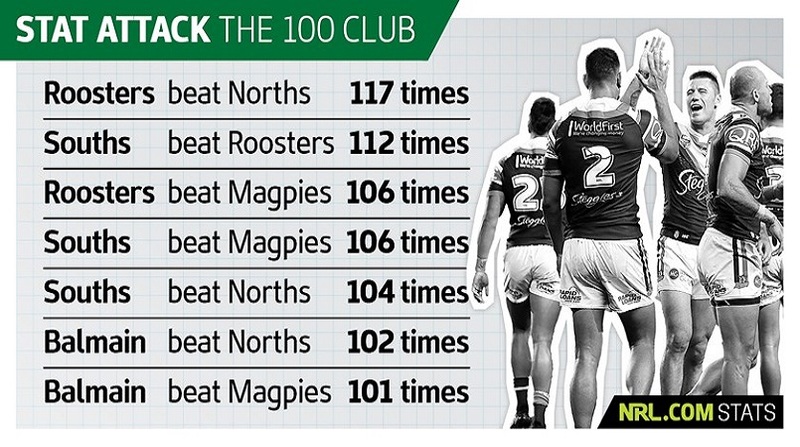 Thursday night's huge clash between foundation clubs the Roosters and Rabbitohs sees the former with a chance to register their 100th win against their old rivals. Given South Sydney's dominance in the first two or three decades from the inception of the code in Australia and a strong record through the middle of last century, they hold the edge over the Roosters with 112 wins. However it is the Roosters who boast the record for the most ever wins against one club, with 117 victories against the North Sydney Bears. The Bunnies downed Norths 104 times and the Balmain Tigers got the better of the Bears on 102 occasions. The poor old Western Suburbs Magpies are, like Norths, on the wrong end of 100 wins against three separate clubs. They lost to the Roosters and Rabbitohs 106 times apiece and to Balmain – the club they would eventually merge with – 101 times.